Download "Using VPN. DJJ Staff"
2 Internet Explorer (32 bit) Enter in the address bar You will need to use IE 32bit. 64 bit machines have the IE 64 bit option as well. 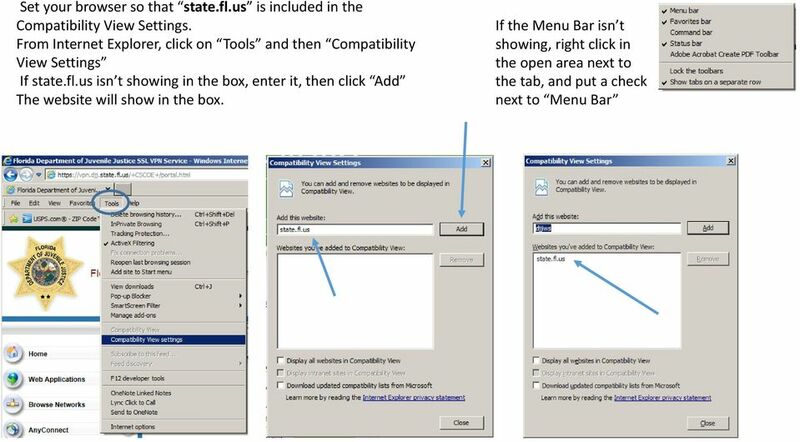 To check this setting Open Internet Explorer and navigate to Help About. If it is 64 bit it will list it here. If it doesn t specify, then it is IE 32 bit. If it is 64 bit, 32 bit IE should be available under Start Programs. Login in using your standard Login credentials Your password can only be changed when it expires or by requesting a password reset. 3 Note: If you are using Windows 8 or 8.1, you must use the Desktop version of Internet Explorer and not the tile or Metro version. 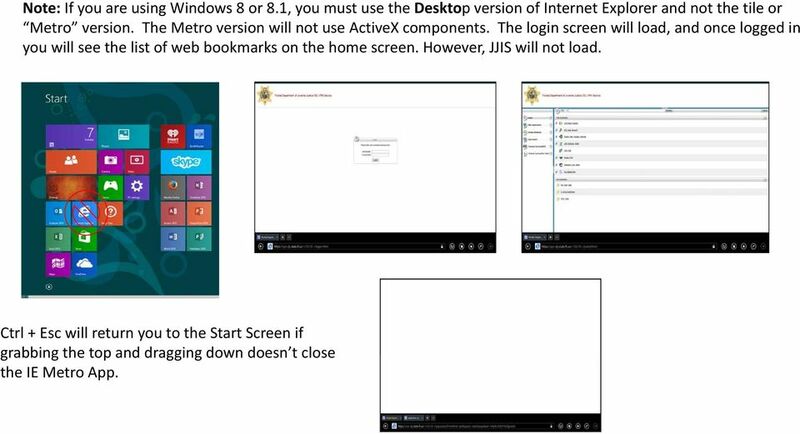 The Metro version will not use ActiveX components. The login screen will load, and once logged in you will see the list of web bookmarks on the home screen. However, JJIS will not load. Ctrl + Esc will return you to the Start Screen if grabbing the top and dragging down doesn t close the IE Metro App. 4 Click on desired application. 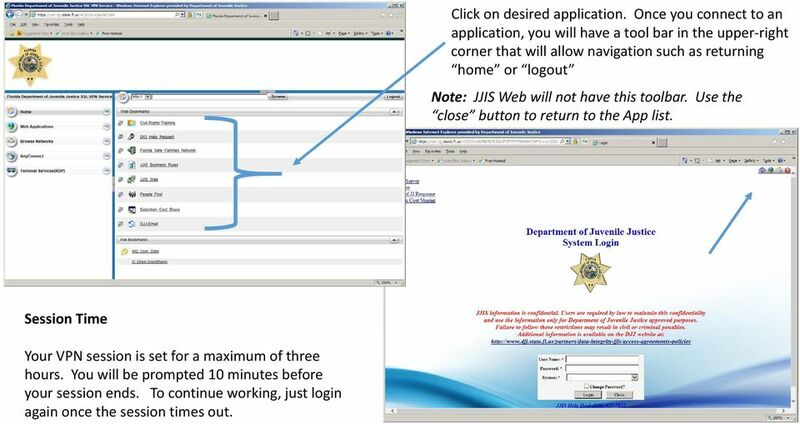 Once you connect to an application, you will have a tool bar in the upper right corner that will allow navigation such as returning home or logout Note: JJIS Web will not have this toolbar. Use the close button to return to the App list. Session Time Your VPN session is set for a maximum of three hours. You will be prompted 10 minutes before your session ends. To continue working, just login again once the session times out. 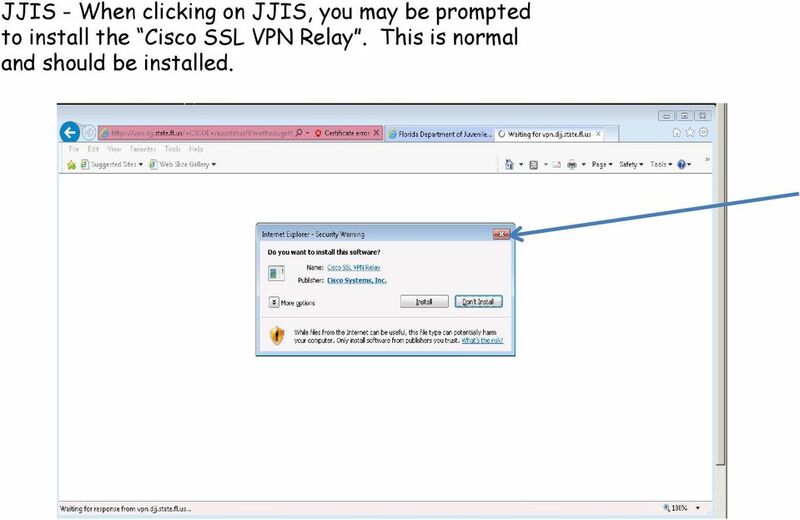 5 JJIS - When clicking on JJIS, you may be prompted to install the Cisco SSL VPN Relay. This is normal and should be installed. 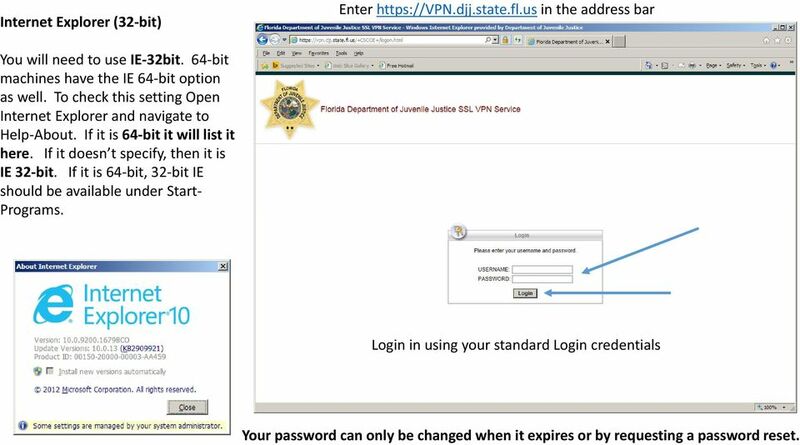 6 Access your K: drive data using the Browse Network section. At the cifs:// box, type in your local server name with /UserData added. 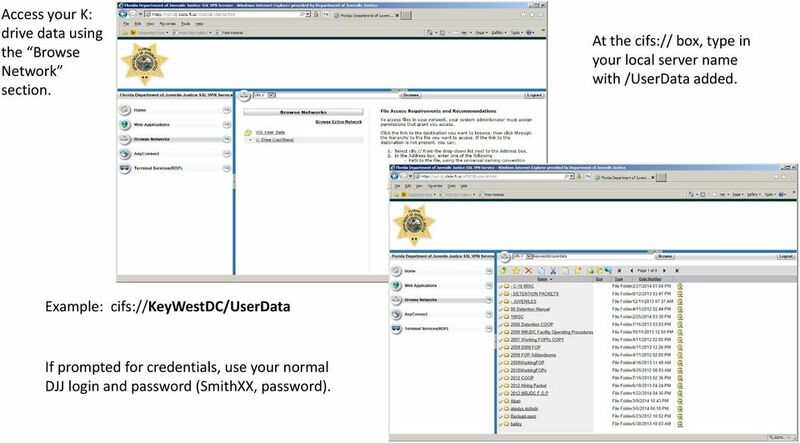 Example: cifs://keywestdc/userdata If prompted for credentials, use your normal DJJ login and password (SmithXX, password). 9 Add the site to your trusted sites list. 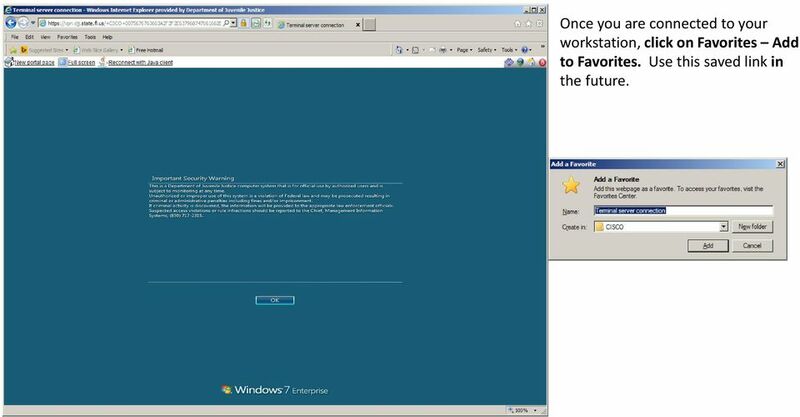 From Internet Explorer, click on Internet Options Security Trusted Sites Sites. Add to the zone. If the site name isn t listed in the box, ask your IT professional to add to the list of trusted sites. 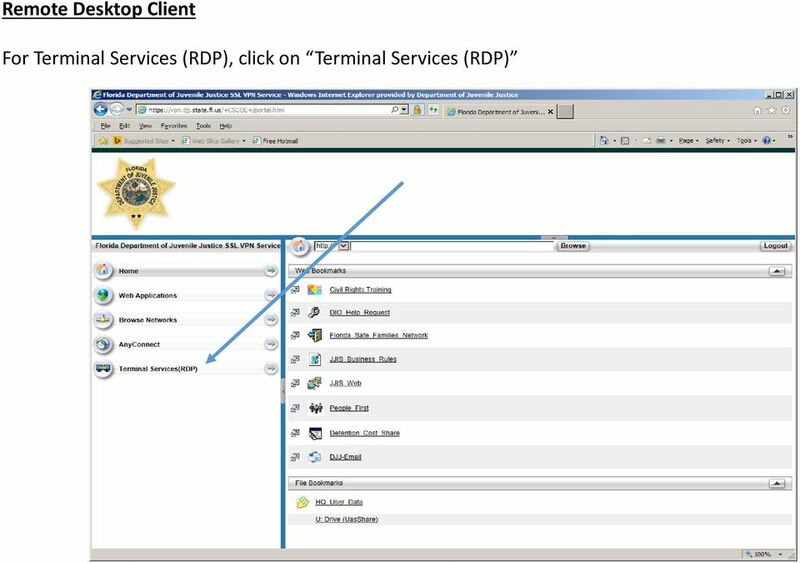 10 Customize the RDP session At the rdp:// box, enter your workstation name along with desired additional parameters that will allow full usage of the RDP client. 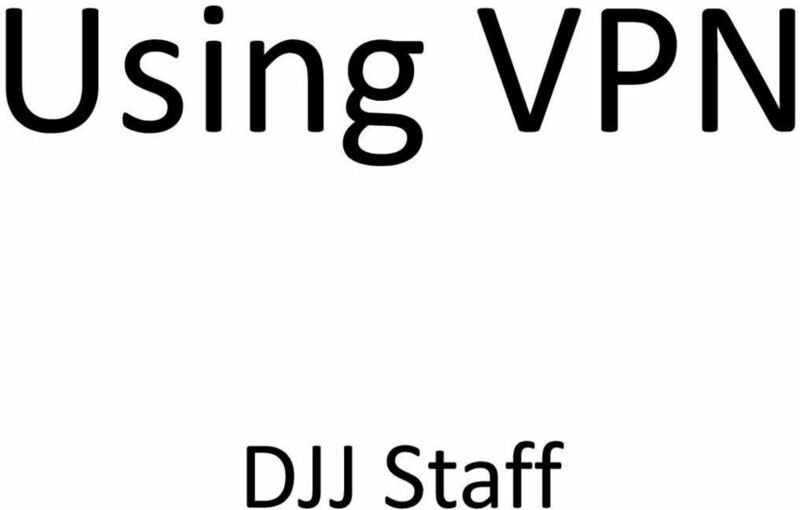 Examples: D /?domain=djj&RedirectPrinters=true or D /?domain=djj&RedirectPrinters=true& RedirectDrives=true These settings tell the session what local printers or hard drives to use. 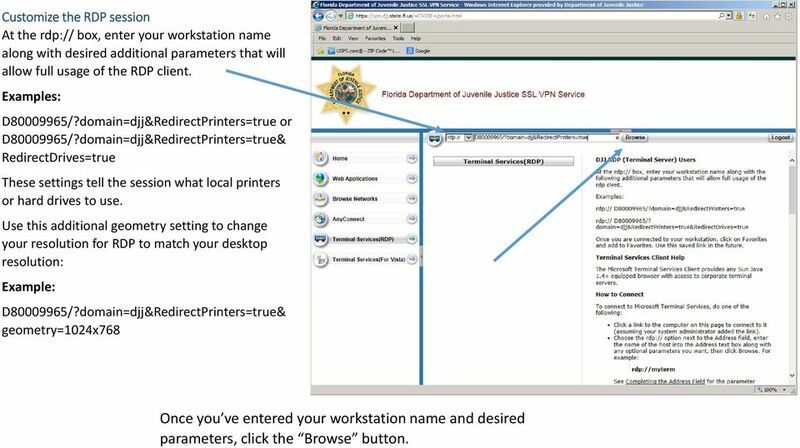 Use this additional geometry setting to change your resolution for RDP to match your desktop resolution: Example: D /?domain=djj&RedirectPrinters=true& geometry=1024x768 Once you ve entered your workstation name and desired parameters, click the Browse button. 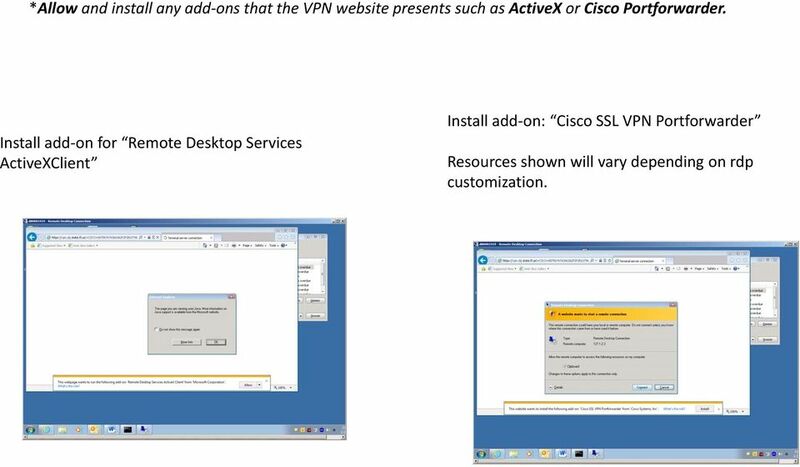 11 *Allow and install any add ons that the VPN website presents such as ActiveX or Cisco Portforwarder. 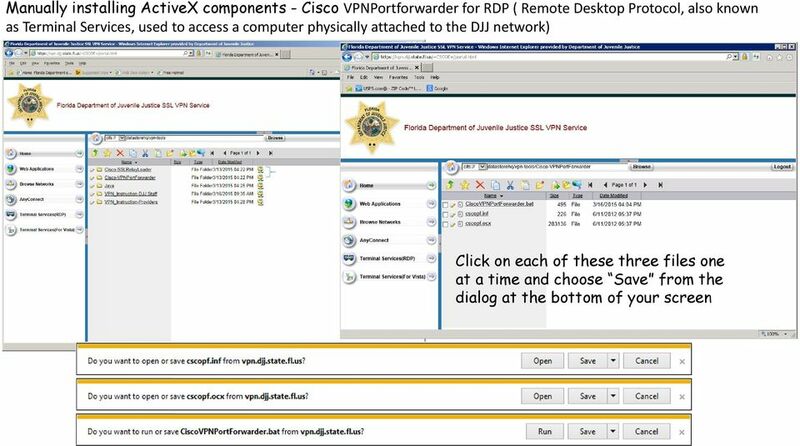 Install add on for Remote Desktop Services ActiveXClient Install add on: Cisco SSL VPN Portforwarder Resources shown will vary depending on rdp customization. 12 If necessary, turn off pop up blocker temporarily to allow add in to install. 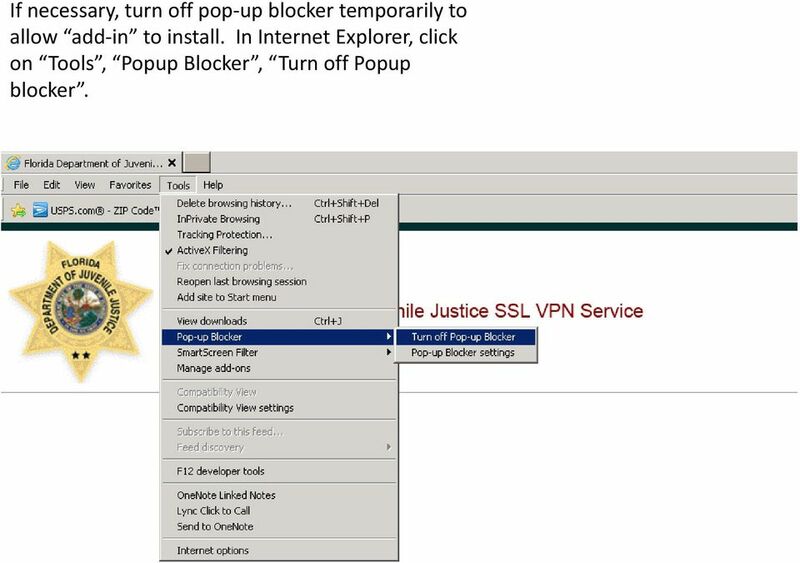 In Internet Explorer, click on Tools, Popup Blocker, Turn off Popup blocker. 13 Once you are connected to your workstation, click on Favorites Add to Favorites. Use this saved link in the future. 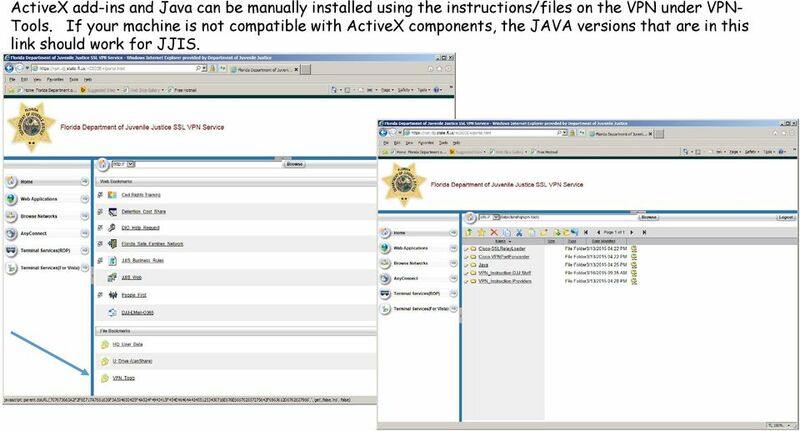 15 ActiveX add-ins and Java can be manually installed using the instructions/files on the VPN under VPN- Tools. If your machine is not compatible with ActiveX components, the JAVA versions that are in this link should work for JJIS. 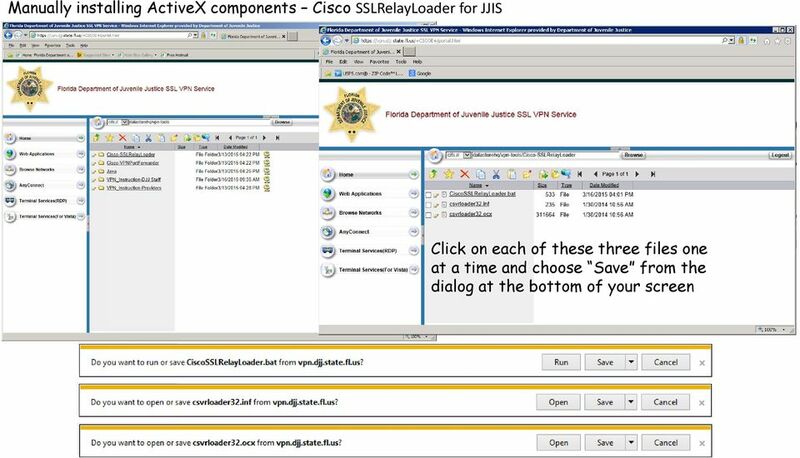 18 Right click on CiscoSSLRelayLoader file (A Windows Batch File created by DJJ MIS) and choose Run as Administrator. The file will open a command prompt window and install the components. Click OK to close window. 20 After each file is saved, you have the option to View downloads. Don t click until all three files have been saved! After all three files have been saved, click on View Downloads to open the list of downloads. 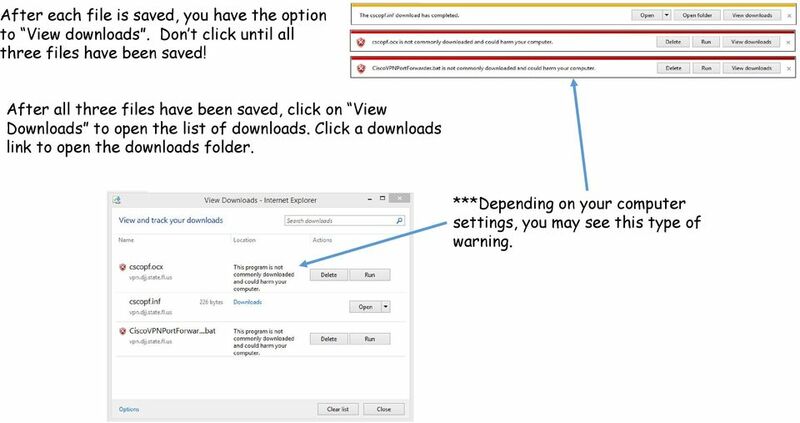 Click a downloads link to open the downloads folder. ***Depending on your computer settings, you may see this type of warning. 21 Right click on CiscoVPNPortForwarder file (A Windows Batch File created by DJJ MIS) and choose Run as Administrator. The file will open a command prompt window and install the components. If prompted to overwrite, enter y to continue. Click OK to close window. 24 Java will install, keeping you informed of its progress. You will receive confirmation that Java has installed successfully Click Enable to run the Java plug-in. If you are unable to use JJIS with this version of Java, repeat the process with each version available until JJIS works for you.